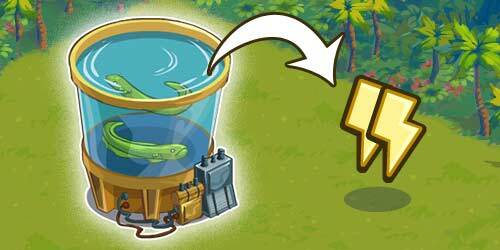 Adventure World Links, Cheats And Tips Guide: Adventure World: Soon MORE Energy With Electric Eels! Adventure World: Soon MORE Energy With Electric Eels! More energy coming your way! Learn how to GAIN + energy FOR FREE! After the Fountain of Youth, just released, it will come these Electric Eels that will allow us to save + energy! Obviously we need to BUILD this new feature! There will probably be three (3) levels that will allow us to harvest + or - energy. More updates will come as soon as they are available. Stay Tunned! Some rummors are that this is a Premium Item (only available for Adventure Cash). While the exact price is still unknown we can confirm it will harvest 10 Energy every day for 90 days and can be recharged after expiration.